There was drama at the Kabwe civic centre during the Mayoral elections today when majority of PF councilors defied the party directive to vote Richard Bango and Jim Cox Phiri as Mayor and deputy Mayor respectively. 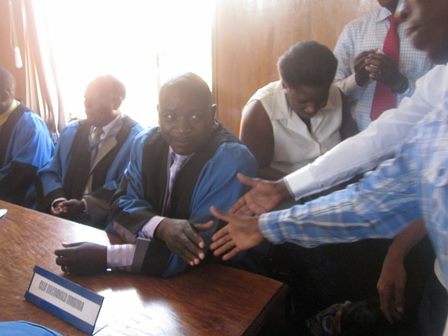 However Bango won the election while MMD’s MacDonald councilors Mwamba was elected deputy Mayor. The election was marred by violence among PF camps as cadres from Lusaka clad in stinking clothes and torn shoes seized the civic centre to block other candidates from filing the nominations. The cadres harassed journalists and other people as police and intelligence officers looked hopelessly. PF preferred candidate Jim Cox Phiri who was last year arrested for illegally selling a piece of church land to two people was a shell of himself after Returning officer Oliver Muuka declared Mwamba as winner. There were also a lot of cadres in the chamber who kept vigil and wanted to spy on all the councilors voting against party directives. Later Kabwe District commissioner Patrick Chishala who abandoned his office to come and witness the elections was heard complaining about the councilors’ defiance. Chishala, the PF cadre who was arrested for shoplifting and also stole church offering from UCZ Saint Mark’s congregation has been instrumental in imposing fellow thieves to the top council seats. He is also one of the 13 disciples of corruption who have been named in the Kabwe plot scam.